The Asean Basketball League’s top three teams remained in the top half of the standings, as the Slingers, Slammers, and Heat continued to scramble for fourth place at the conclusion of the first ever ABL Hoops Fest in Saigon, Vietnam. The Slammers came up big with only their fourth win in twelve tries, but it was a win they needed badly. Thai ace Wutipong Dasom had a miserable offensive game throughout Sunday afternoon, but he connected on the biggest shot of the match. Dasom made good on his fourth three-point attempt (he missed his first three shots from beyond the arc) with less than a minute left, and he finished 11 points. More importantly, however, that shot pulled the rug from under the Slingers and gave the Slammers a confidence-boosting W. Christian Charles continued to be solid for the Thais with 19 points and 15 rebounds, while fellow import Darius Brannon finished with 11 points and 12 boards. San Miguel, meanwhile, remained a game behind the league-leading Warriors after they beat the hometown Heat, 80-55. Chris Banchero continued to be SMB’s most potent scorer, nailing 20 points while dishing out 2 dimes and getting 1 steal. He was backstopped by the Williamses – Brian and Justin – both of whom combined for 27 markers and 26 caroms. Williams also rejected 4 Saigon shots. The Heat were imited to a paltry 19 rebounds for the entire game, with import David Palmer grabbing 8. Pint-sized Pinoy sniper Jai Reyes led the way for Saigon with 14 points and 6 assists, but shot just 4-of-11 from the field. Saigon has now dropped its seventh match of the tournament, and is on-track to continue bringing up the rear as the regular season continues well into the summer months. Fil-Am import John Smith had maybe his best ABL game ever, dropping 26 markers on the Dragons as Indonesia continued to pace the 6-team field with their ninth victory. Smith hit 9-of-14 FGs, including 6 treys, for the Warriors, who are still missing the services of ace two-guard Stanley Pringle. Chris Daniels pocketed 17 points and 17 rebounds, while playmaking wonder Mario Wuysang produced an all-around effort with 13 points, 6 rebounds, 4 assists, and 2 steals. Gavin Edwards, Justin Melton, and Shee Fai Loh scored 18, 16, and 11 points respectively for the Dragons, who are at third place with an even 6-6 card. SMB's Justin Williams won the Slam Dunk contest with an almost-free-throw line slam! 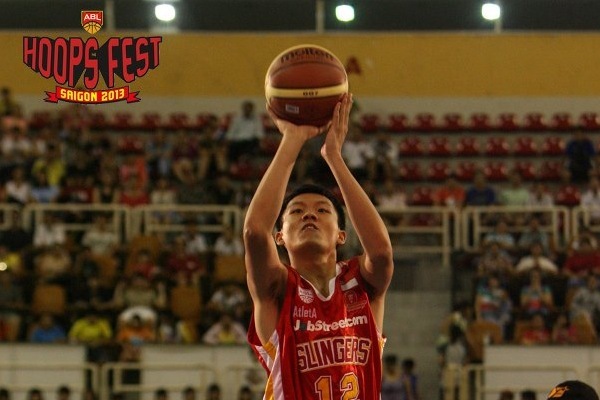 Singapore's Lim Sheng Yu won the 3-point Shooting contest! Wutipong Dasom was left open with 43 seconds left as he made a three-point shot to help the Chang Thailand Slammers beat the JobStreet.com Singapore Slingers 58-56 at the ABL Hoops Fest Saigon 2013. Chris Charles led his team with a double-double by scoring 19 points and grabbing 15 rebounds. Dasom and Darrius Brannon finished with 11 points each for the Slammers who outscored the Slingers 30-12 in the paint. The Slingers started the game blazing hot when they took an early 17-2 lead on a left handed shot from Rashad Jones-Jennings. Chris Charles sparked a Slammers rally by scoring 7 points in the first quarter to cut the Slammers' deficit to 20-15 after one quarter. The Slammers kept on fighting in the third until they made a 10-0 run capped off by a field goal from Froilan Baguion and Charles, giving the Slammers a 43-40 lead with 3:34 left in the third quarter. 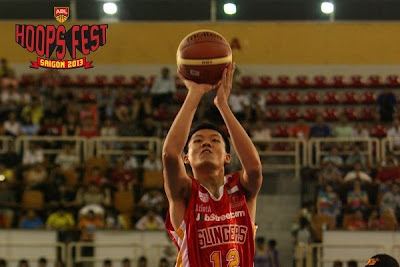 Fortunately, the Slingers were able to gain their lead back behind Jun Cabatu's hot hand. Cabatu scored 5 points late in the third quarter that gave the Slingers a 47-45 lead as the headed into the final quarter. Early in the fourth quarter, Cabatu made a shot that stretched the Slingers lead to 6 points with 7:29 left in the game. Then things started to turn around as Chanachon Klahan made a pair of free throws and a lay-up from Brannon shaved the Slingers lead further to 55-53 with 5:10 left. After a fast start in the first quarter, the Slingers struggled to find their offense late in the game. Up by 1 point, the Slingers left Dasom alone in the three-point line which led to the Slammers taking a 2 point lead with 43 seconds left. The Slingers had a chance to tie or win the game but Don Dulay converted a turnover as the Slingers suffered their seventh loss of the season. Cabatu led the Slingers with 19 points while Jones-Jennings recorded a double-double after posting 16 points and 16 rebounds for the Slingers who only received 5 points off the bench. The Saigon Heat faced the San Miguel Beermen on the final day of the inaugural ABL Hoops Fest Saigon 2013. Chris Banchero scored 20 points, Justin Williams played a complete game wih 11 points, 12 rebounds, and 4 blocks as the visiting San Miguel Beermen shut down the hometown Saigon Heat on the final day of the innaugural ABL Hoops Fest. The sellout crowd tried its best to will its team to vicory, but in the end Saigon's depleted roster - playing without star world import, Dior Lowhorn - couldn't keep up with the size and strength of the Beermen. The Beermen jumped out to a nine point lead in the early going, starting the game on an 11-2 run. A pretty Jai Reyes floater over the outstretched arms of Asi Taulava pulled the Heat back within 7, but the inside-outside tandem of Brian Wiliams and Chris Banchero proved too much for the shorthanded Heat and the Beermen finished the quarter leading Saigon 21-8. The Beermen continued to abuse Saigon down low in the first half of the second quarter. Newly crowned dunk champion Williams showed off his leaping ability when he skied for a two handed slam at the 4:40 mark to put San Miguel up by 25. He was also a force of nature on the defensive end, blocking three shots and setting the tone for the Beermen's stout defense. However, the Heat fought back during the final five minutes of the period, giving the capacity crowd good reason to cheer. Reyes lofted in a floater over Williams, David Palmer finished strong through contact in the post, and Reyes chipped in a three pointer with two to go in the quarter. When the half concluded, the Heat found themselves down 15, trailing the Beermen 41-26. The celebration continued at halftime, as a fan proposed to his girlfiend in the stands and the Heat faithful cheered in approval when the bride-to-be exclaimed a gleeful "yes" into the microphone in font of the crowd. The two teams opened the third quarter trading blows. With 5:52 remainng in the third, Williams threw down a dunk in transition to push the Beermen lead to 19. But the Heat struck back, clawing to within 14 on yet another Reyes three pointer with 3:30 to play in the third. Despite a vastly improved performance on both sides of the ball, the Heat failed to make up any ground, closing the third quarter trailing the Beermen 40-55. The Beermen weathered a barage of Heat three pointers at the start of the fourth, and clamped down to push the lead to 66-43 with 7 minutes remaining, and put to rest any notion of a comeback. After a pair of Banchero free throws with 4:52 remaining, the Bermen led by 25, and the game was all but over for the Heat. Al Vergara hit a three with 2:55 remainig, followed by a breakaway layup for Ly Hoang Son, but it was too little, too late, as the Beermen held on for an impressive80-55 victory over the home team. 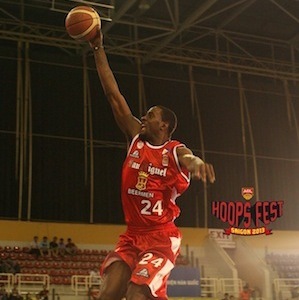 Indonesia Warriors outscored the Westports Malaysia Dragons 36-12 in the third quarter to grab a comfortable 84-67 win in the last game of ABL Hoops Fest Saigon 2013. John Smith led the way for the Warriors by scoring 18 of his 26 points in the second half. Chris Daniels recorded a double-double with 15 points and 14 rebounds, followed by Mario Wuysang with 13 points and Ronaldo "Dodo" Sitepu had 12 points for the Warriors who now have 9 wins and 3 losses. Both teams struggled to find the basket in the first quarter. Midway through the first quarter, the scoreboard only read 5-5. Then, the Warriors gained the upper hand going to the second after Steven Thomas made a hook shot and a free throw from Wuysang to put them ahead 12-7 with 8 seconds left in the first quarter. It was tight going into halftime. J. Smith converted a three-point play which gave the Warriors a 32-28 lead with 1:17 left before halftime. The Dragons responded immediately with a basket from Justin Melton and a four-point play from Loh Shee Fai, giving the Dragons a 34-32 lead going into the locker room. The third quarter was all about the Warriors however, who made 8 three-pointers in the quarter. J. Smith was unconcious as he made back to back threes late in the third quarter which gave the Warriors their biggest lead of the game 68-45. Despite Melton's brilliant performance in the fourth quarter, the Dragons were only able to get as close as 12 points. Gavin Edwards led the Dragons with 18 points and 10 rebounds while Melton finished with 14 points. Loh Shee Fai added 11 points for the Dragons who now at .500 with 6 wins and 6 losses. Source: Game recap was compressed and compiled from AseanBasketballLeague.com. Cool that you write the articles, but the vocabulary is from football not basketball. Might be better if someone with basketball background wrote the story-sorry, just saying. Oh do you mean "football" vocab is used for the game recaps or the intro? the intro is "very basketball" in style. i write those. the game recaps in the second half of the piece are just compressed from the actual ASEAN Basketball league site. i've made that very same comment about their writing style before, but they haven't changed it yet. i think it's mainly because the guys behind the ABL site are from singapore or malaysia, which might explain why they haven't gotten the "basketball" vocab down pat just yet. 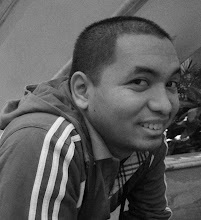 Flojo would be running a football blog instead if he didn't have that basketball background.